Renata Stanko of Oregon submitted this recipe for our Healthy Eating Contest. All the ingredients in my recipe are healthy. I try to stay away from white sugar and often use honey instead. Cranberries are rather sour but are very tasty combined with the honey and they work well in this slightly cooked kale salad. I feel this quick steamed kale is more palatable than completely raw kale. On Thanksgiving I served this salad I created myself but since then it has become a favorite side dish. A fun ingredient for the kids is the cut cranberries that look like wheels. Slice cranberries into thin discs with a knife. Mix with honey and set aside. Remove center stems from kale and use for another time (for example soup). Cut kale leaves into thin ribbons. Cook leaves in a rice steamer for 1 minute. Alternately use a pan with a small amount of water. After 1 minute remove kale and place in a colander. Cool under cold running water. Drain well and set aside. Combine juice, oil, clove and salt and pepper. Add cranberries with honey. 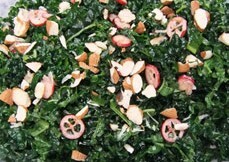 Mix kale with cranberry dressing and sprinkle with almonds.